There was a security guy who worked in our office until recently. Every day after work as I was headed home we would stop for a chat and he would tell me a joke. Him and his mates tell a lot of stories when they get together. Some true, some perhaps not so true. It got me thinking about storytelling. And about how there is some feeling in me of a weird kind of expectation. Like somehow I should know how my friends are because of Facebook and other social media sites. But I don’t really know how they are. Sure those places give me glimpses that I wouldn’t otherwise see. But it’s not the same as sharing a table, pressing our hands together or wrapping them in a firm hug. 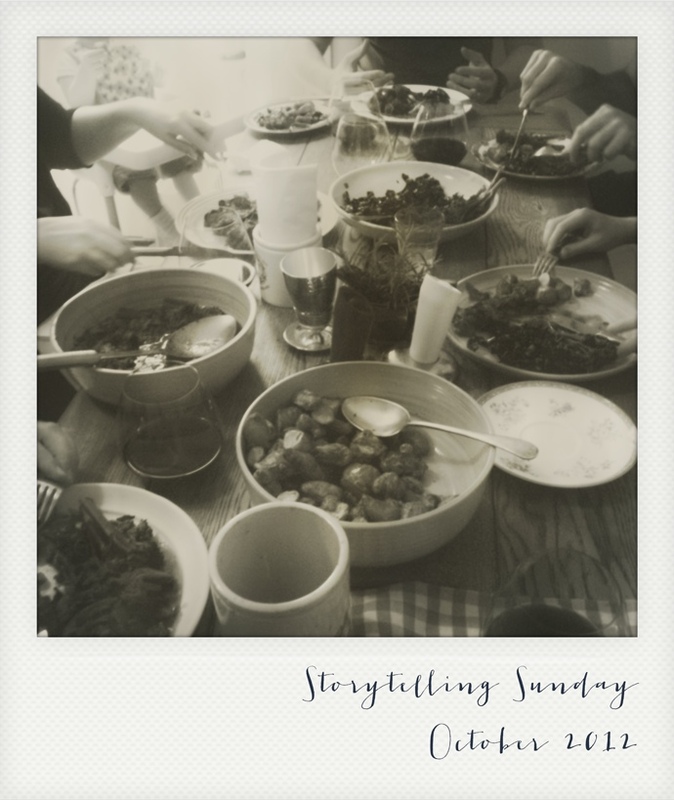 So I invited some friends over for a storytelling Sunday. Let’s catch up with each others lives and share a little bit extra. Everyone brings their own empty plate. I will fill it with food. And while we eat, lets all tell the story about how this particular piece of tableware came into our life. Even our tiniest diner (just 1 year old) had a plate and a story (as told by her mama). Perhaps I will do another one sometime. That is an amazing idea! I love it! It’s the perfect thing to do now that the weather is getting cooler. I would love to try this. What a beautiful idea! Loving this pic – and yes, I would totally try this!